Good option as a US poker room. Not a high-traffic room, but still playable. Aced Poker is a good option as a US-friendly poker room. It's the second highest traffic US poker room after Bovada. The software is reliable, and you can get a game up to $600NL (or start at $2NL if you prefer). Aced is one of the oldest rooms on the Merge Network, and it's a network that has been servicing US players since 2007, without interruption. That's a handy track record to have. There have been bouts of slow withdrawals in the past, but so has every US-facing poker room. That's just due to the landscape of online poker in the US, and not a reflection of the room operating on it. Aced aren't going to take any customer support awards away from Apple, but at least you know you're dealing with a fair bunch of people with an acceptable history. I haven't lost any sleep over keeping a balance with them. Players are very weak at the lowest stakes. The weakest aspect of the Aced Poker room (and Merge Network as a whole) is it's low volume of players. Nonetheless, the traffic that does frequent the room is soft at many of the lower stakes and is pretty standard at $100NL and above. How low is the traffic? Well, its not so bad that you won't be able to multi-table 4 tables up to the $200NL stakes; there is enough traffic to do that. You just do not have a lot of choice when it comes to table selection. It's like moving from a town in to a village and having to make do with kids that live there, because you just ain't got that many options for friends anymore. It's not difficult to become familiar with usernames at Aced, but at least there are always new names flying around. Very good multi-tabling features and options. Standard software, but it does have some cool features. Full table design isn't gorgeous. 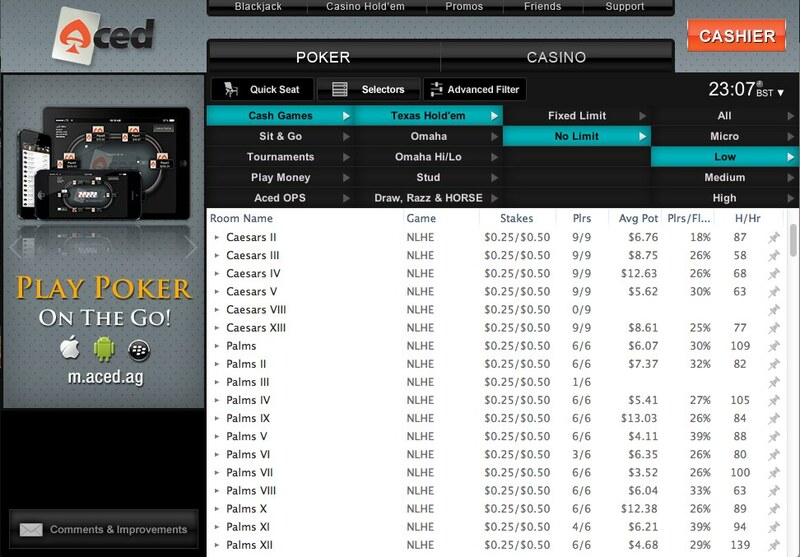 Overall, the Merge network offers a very cool set of features on a decent poker client. It's not the fastest or sleekest software out there, but it's not one you can pick many faults with. It is very easy to multi-table at Aced with the re-sizeable windows in addition to a "mini-view" style window that can also be re-sized. 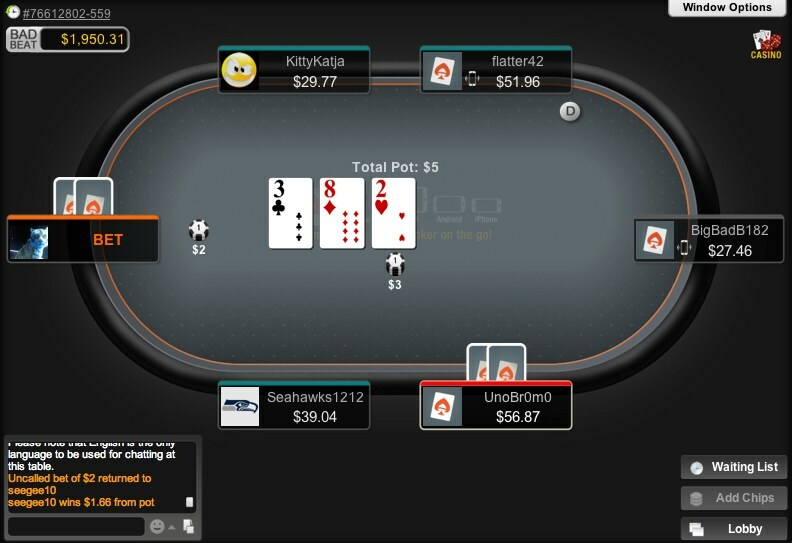 There are also numerous other options on offer to make multi-tabling easier, which really sets Aced Poker ahead of the curve when it comes to playing at multiple tables. The table sounds are unusual, so you're going to want to click around in the "sound settings" area to sort that out. The cards and general table graphics are clear, as are the numbers for; pot, bets, and stacks. All the important stuff is visible so no playability problems there. I can't say I'm going to keep a screenshot of the poker table in an oak wooden frame atop of my grand piano, but I don't hate to play poker using this particular graphical user interface. If you don't like the default table design you can always choose from a variety of other horrendous combinations. 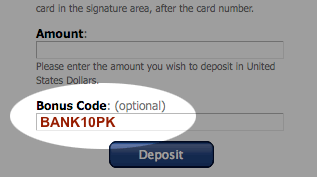 Use the bonus code BANK10PK to ensure you get the 200% up to $5,000 bonus when making your first deposit. This bonus code will also give you an extra $10 in entry coupons, which is nice. You have to make a deposit first before you get them though.